Remove the pulp from two ripe purple passion fruit and push it through a strainer to remove the seeds. You should have about two tablespoons of thick extract. Chop the coriander leaves finely and whisk all the ingredients together to make an emulsion. Set aside.Whisk again just before serving. 1/2 cup finely chopped shallots. 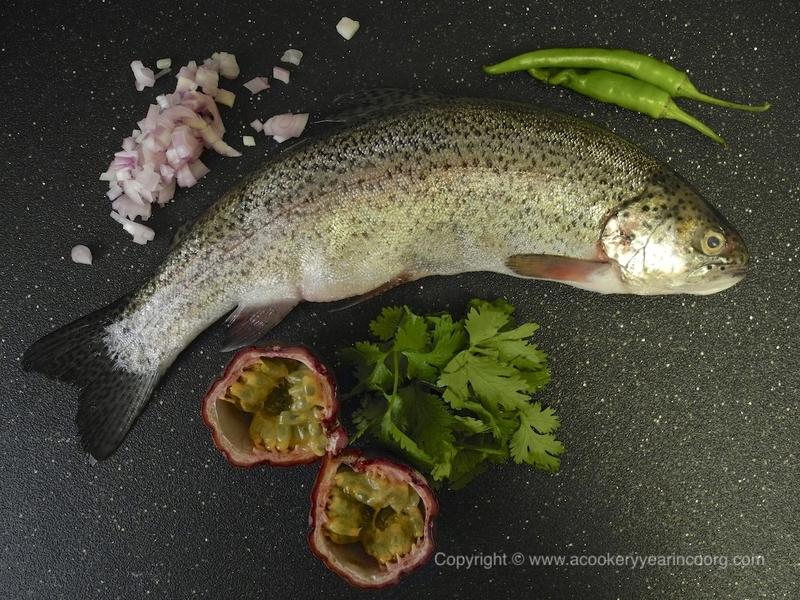 Pat the cleaned fish dry and then rub a mixture of salt, pepper and chopped coriander stems over and inside the fish. Heat the oil and butter in a pan (you can bake or broil the fish too, but trout loves this butter bath!) and add the shallots. Stir for a minute, then add the fish. Cook both sides on medium heat. Remove to a platter and serve it up with a side of roast potatoes and a dollop of the passion fruit dressing. I think this would make a great marinade for pork ribs or chops and oily fish like salmon. It also makes a terrific salad dressing – perfumed, sharp and with just a little bite.